Have you caught the Colorado bug for the outdoors, adventure, and are looking to explore rocky mountain national park? Look no further than an adventure down some of Colorado’s wild rivers. If you are staying near Rocky Mountain National park you have two options for rivers in the area. If you are accessing the park from one of the east entrances (generally the most popular and heavily used) you would be closest to the Cache la Poudre or commonly know as the Poudre River. Located only fifteen minutes from Fort Collins and 45 minutes form Estes Park is the Cache la Poudre meaning cache of powder. This refers to a story from the 1800s where French trappers were caught in a snowstorm and they hid and buried gunpowder to lighten their loads. The Poudre River is one of the bigger rivers on the east side of the Continental Divide in northern Colorado. The river drops 7000 feet in elevation in 125 miles out of the mountains on its way into the plains. The Cache la Poudre River is Colorado’s only wild and scenic river. 76 miles of this river are designated wild and scenic while 30 miles of this section are considered wild and free flowing and 46 miles are designated for recreation. There are only a handful of companies that are allowed a special permit to operate on the Poudre River. They offer a multitude of trips from mild to wild. Most trips run from 2-3 hours long. There are four different sections you can run commercially on the Poudre River depending on river flow. The rapids on the Poudre River range from class II to class IV. Generally, class I is easy, class II is novice, class III is intermediate, class IV is advanced, class V is expert, and class VI is not raft-able. If you are accessing the parks west entrance near Grand Lake, then you are at the footsteps of the mighty Colorado River. The Cache la Poudre and Colorado River have adventures for everyone of all abilities and experience levels. There are half day, full day, and over night river trips available. The headwaters begin just on the West side of the Continental Divide and flow through the southwestern United States. The Colorado River is one of the most controlled rivers in the world as every bit of it is allocated for use. Just outside Rocky Mountain National Park, the Colorado is used for recreation with plenty of different sections to choose to enjoy. 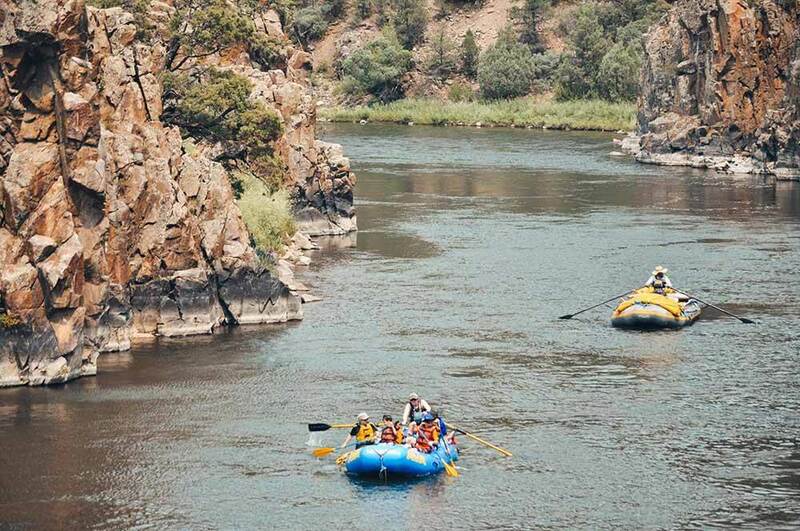 The most rafted stretch on the Colorado is a scenic stretch for those in search of a more relaxing experience. This is the perfect trip for the whole family and can be run as a half day or full day trip. Those that raft this river take in beautiful granite walls and bald eagle sightings. For those looking to take their trip to the next level; a overnight trip might be the perfect true Colorado experience. An overnight trip ensures more time on the river while taking in the scenery around them. All the overnight gear you need is provided if you take this trip with AVA. If you are looking for arguably one of the hardest and most dangerous sections of river to run, then Gore Canyon has you covered. From fast technical lines to big waterfall drops, the Gore has you covered. This trip is not for novice or inexperienced rafters. Giant canyon walls located on both sides of this river make this river stunning. Gore is the head waters of the Colorado River and only runs late in the summer as the water is too high early in the summer. If your looking for an adventure just outside rocky mountain national park give one of the local outfitters a call. They have years of river knowledge and experience that could make your whitewater adventure a trip of a lifetime.